-Holy sheeeet…this cover. 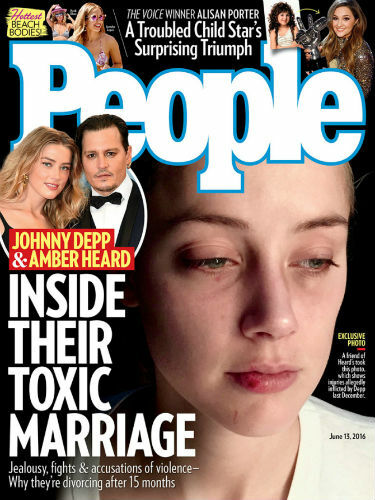 The fact that People magazine — who crowned Johnny Depp the Sexiest Man Alive in 2003 and 2009 — are running the photos of Amber Heard’s bruises boggles my mind. It’s getting harder and harder for Depp diehards to defend him — not that that’s stopped them. -Director John Carney has apologized for slamming Keira Knightley and I’m actually really impressed with his statement. This isn’t the typical Hollywood “I’m sorry if you were offended” non-apology. -I cannot wait to have enough time to watch THR’s comedy actor roundtable, which includes Aziz Ansari, Jerrod Carmichael, Tony Hale, Keegan-Michael Key, Rob Lowe, Anthony Anderson and Jeffrey Tambor. –Hayley Atwell thinks there’s still hope for more Agent Carter. Don’t tease me! -Speaking of comic shows, how much doo-doo do you think Willa Holland is in for calling out DC? -Did Hailey Baldwin go from dating Justin Bieber to Drake? She’s going to run out of famous Canucks soon. -Some good insider baseball-y TV stories came out today, including news that most networks are using live +7 days instead of the typical live + 3 days as their primary metric for upfront deals — and the future is live + 35 days! -Less insider baseball-y is this great piece on how TV is killing off so many characters that death is losing its punch. -Which leads into another great piece, this one rebuting yesterday’s ‘fandom is broken’ crapstorm. “This touches on some current trends of creators to create unimportant drama out of nonexistent hardships that have no narrative place in the story being told just because it seems more interesting when it reality it is laziness and complacency for the status quo rather than thoughtful art…Happy stories do not mean lazy writing.” Word. –Ellen Pompeo is never, ever going to give up her Grey’s scrubs. Can’t say I blame her, tho. –Megan Fox says her fetus told her to move, so she did. Ok, but if her unborn baby is so smart, shouldn’t it have warned her against doing TMNT 2, which is currently sitting at 17% on RottenTomatoes? –Jena Malone named her baby Ode Mountain DeLorenzo Malone, which is both hilarious and unsurprising in the least. -The woman who directed The Night Manager (which I just binged and loved) is reportedly on the shortlist to direct the next Bond film. –Nicholas Hoult turns to drug smuggling to save Felicity Jones in the new trailer for Collide.